Sixers’ guard Marco Belinelli during his tenure with the Atlanta Hawks earlier this season. He was waived after the trade deadline. 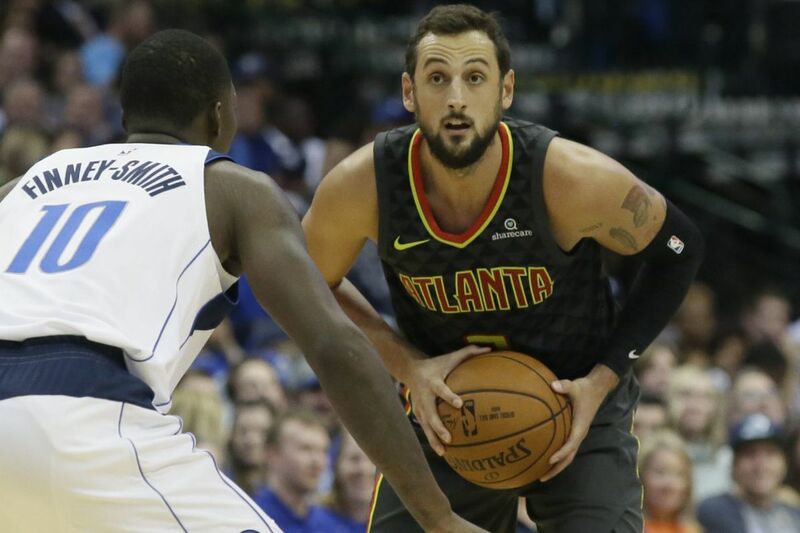 Sources confirmed Saturday night that guard Marco Belinelli will sign with the Sixers after clearing waivers following his buyout from the Atlanta Hawks. What does the addition of Belinelli to the Sixers' roster mean? Well, that's exactly what we're talking about. Belinelli, 31, is a 6-foot-5 guard from Italy who is in his 11th year in the NBA. Drafted 18th overall by the Golden State Warriors in 2007. Belinelli spent time in Toronto, New Orleans, and Chicago before landing with the San Antonio Spurs in 2013. Belinelli won an NBA title with the Spurs in 2014 as an integral player off the bench. He shot 40.5 percent from three during his time in San Antonio. Since then he as played with Sacramento, Charlotte, and most recently Atlanta. Belinelli confirmed the deal, and gained the fans' favor with his "TRUST THE PROCESS" tweet and adding "Philadelphia 76ers" to his Twitter bio late Saturday. Averaging more three-point attempts than ever before in his career, Belinelli is still hitting at a reasonable clip of 37.2 percent this season, and that's exactly what the Sixers want from him. Belinelli not only brings veteran playoff experience to the Sixers bench, he also gives the team a reliable player who is good at creating space off the ball and hitting from deep. He is the kind of player who has few liabilities. He is shooting over 90 percent from the free throw line this season, sets good screens, averages just one turnover a game, and can shoot the ball. Additionally, Belinelli has a bit of a reputation as a clutch shooter. He has multiple game-winners under his belt, and is the kind of player who can hit a shot when his team really needs a bump in a high-pressure situation. The addition of Belinelli to the Sixers' roster makes a Markelle Fultz return look even less likely. He has not played since October. If Fultz were playing at a reasonable level and available every night, it's doubtful that the Sixers would have gone after the veteran guard. This also makes it look as if we will keep seeing less and less of Jerryd Bayless and Timothe Luwawu-Cabarrot as the postseason nears. Both players have their own liabilities, whether its streaky shooting, trouble fouling, or careless turnovers. Expect to see both players with DNP next to their names more often as the season winds down. Knocking down threes. That's the reason the Sixers wanted Belinelli. He'll be expected to infuse the bench with the kind of poise and discipline that only a veteran can. Though he's averaging 4.8 three-point attempts this season, the Sixers would probably like to see that number just a little bit higher and hope that he can get his shooting percent into the 40s. Since the Sixers didn't have to give up any assets, and they have a roster spot available for Belinelli, there's virtually no risk to the acquisition. The Sixers' hope is that there is a favorable reward.